The Islands in the Saronic & Argolic Gulf, have an important history and an interesting tradition of many centuries, as they were inhabited from the prehistoric era, during which they were greatly developed. The Macedonians and the Romans conquered the Saronic Islands, while during the Byzantine era pirates were constantly invading the islands. However, their contribution to the Greek Revolution in 1821 was of ultimate importance. In this sailing area the winds normally are friendly and this is why Saronic routes are highly recommended for easy sailing, especially in July and August for avoiding the strong winds blowing in the Cyclades. You will find many Attractive towns, ancient temples, Byzantine castles, small fishing ports and unspoiled anchorages. You canl visit, Aegina, Epidaurus, Poros, Hydra, Spetses,and Salamis, (in a week charter),also Yerakas, Leonidion, Monemvasia ,Nafplion, Elaphonissos and Kithira (in two weeks charter). We are sure you will be happy and surprised of the natural beauty,sandy beaches, and the friendly people. The Saronic Islands have an important history and an interesting tradition of many centuries, as they were inhabited from the prehistoric era, during which they were greatly developed. Their acme continued during the oncoming years, especially in the field of commerce and shipping, but it was bound when Athens became the major shipping leader after the Persian Wars. The Macedonians and the Romans conquered the Saronic Islands, while during the Byzantine era pirates were constantly invading the islands. However, their contribution to the Greek Revolution in 1821 was of ultimate importance. The verdant island of Angistri with the crystal clear beaches, the much-frequented island of Aegina with the picturesque settlements, the famous for its therapy spa islands of Methana, the exceptionally noble island of Poros with the unique natural beauty and the fine tourist substructure, the historical island of Salamina, which pulses with impressive sites, the non-identical island of Spetses with the beautiful gigs and finally the cosmopolitan island of Hydra which has been declared scheduled, compose the irresistibly attractive icon of the Saronic Islands cluster. The island of Aegina, in the middle of the Saronic Gulf, has been at the crossroads of cultures and rival actions for many thousands of years - from the mythical Aiakeans to the second world war. terraced hill-sides of olive trees and aquamarine water. Luckily, the island is large enough to maintain many places of refuge from the crowds and the intrepid explorer will be well rewarded. Despite its small area (83 square kilometres), it offers great variety and has no reason to feel jealous of other "cosmopolitan" islands. In Poros you can always find a nice free place for your yacht, Poros looks like a simple prolongation of Argolis Peloponesse, since the isthmus that separates it from the Mainland of Peloponesse is narrow. You get a feeling that Poros is a small Vosporus. Looking around makes one feel like being embraced by the island and its environment. 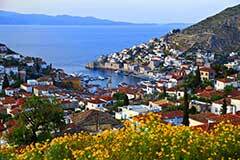 Poros lays right in the middle of the Saronic Gulf. 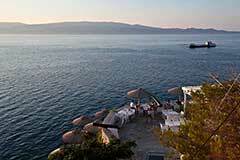 You need only short sailing to reach Aegina, Hydra, Methana or Epidauros. You can get the ferry to Peloponnesus mainland, ready to explore Nafplion, one of the most beautiful towns in Greece, the ancient Mycenae, as well as the Epidavros village and the most famous theatre all over the world, the Ancient theatre of Epidavros. 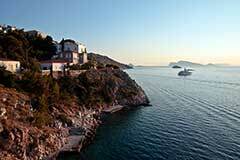 The first time visitor stays astonished by the imposing Manors that are located to the harbour of the island. Left and right to the entrance lie the bastion with cannons that used to protect the city from attacks. Today the port of Hydra is full of boats that anchor here. There is no transportation in Hydra, except from donkeys that will accompany you to your excursions and anywhere you would like to go. You can visit the Manors and the Museums, walk through the picturesque paths and swim in beautiful beaches such as Hydronetta, Avlaki, Kamini and Spilia, while you are in Hydra. In order to go to other beaches you must go by sea transportation only. 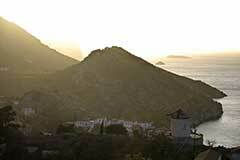 The island has got a population of 3.000 and it is known for its natural wild beauty and its hospitality. 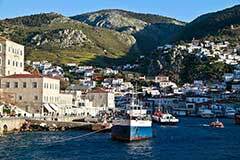 Our advice for sailors is to get in the harbor of Hydra early in order to find a free berth in a normally very busy port. As you sailing into Hydra's harbor , a magic feeling surrounds you. Perhaps it's in the unique architecture and graphic scenes throughout the Island, or perhaps it's in its long history and rich heritage, or even - a fusion of all. A stroll through the town's picturesque cobble stone streets, will convince you of its uniqueness. ... The town which is the centre of the whole island, is built amphitheatrically around the port. It looks glamorous like an art-paint, with grey, white and blue colours above the blue of the sea, an exemplar of architectonics and aesthetics. Right and left from the entrance of the port, there are the Parapets with the Canons, which protected the town. ...At the left side of the port, after the statue of A. Miaoulis, we can find the Harbour Authorities of Hydra, which are accommodated in the old, stonebuilt powder magazine. Next to the Harbour Authorities is the marble Archive Building of Hydra and further we find the house of Tsamados family, which accommodates the famous Sea Captain Academy. The road leads to the location "Gymnastirio" and to the piny area of the Temple of Saint Fotini. The road which begins from the middle of the port, leads to "Kala Pigadia" and it ascends to the Temple of rophet Elias and the Temple of Saint Eutaksia. At the center of the port is located the Cathedral which was built in 1648 and reconstructed in 1774. Aforetime operated as the Holy Church of dormition. Today, in the Temple, are located the headquarters of the Town Hall and the Ecclesiastic museum. At the right of the Temple of Virgin Mary, begins a tight, paved, ascending road, which leads to the old city, Kiafa. The road passes through the location "Gyrokomeio" and then leads to Vlihos. At the right side of the port, the coastal road passes under the House of Koundouriotis, from there reaches Spilia, then Milous and Kamini to finally arrive at Vlihos. Main characteristic of Hydra is that there are no wheeled vehicles and the transportation of people is being made only by donkeys, a thing that makes the Island even more romantic. The port of Hydra is filled with little and big yachts, boats and cruisers. 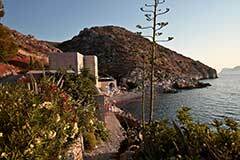 On the Island you will enjoy romantic walks in the narrows, picturesque, paved alleys. Generally, Hydra is famous for the calm life is offers to the visitors in the day, but also for the intense, cosmopolitan night life. Bar, pub, disco, with foreign-Greek music and rave-up till the morning. Hydra, with its continuous offering to tourism and to the culture of our country, remains the adornment of the Saronic Gulf and one of the most important resorts that Greece has to offer. In Hydra is located the Cathedral of Hydra - Spetses - Poros -Aigina. Today, Bishop of Hydra is the venerable Efraim. 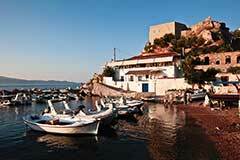 The Cathedral of Hydra accommodates the Town Hall and the Ecclesiastic museum. Is located at the entrance of the Bay of Argos. It was first habited in the Early Helladic era (2500 - 2000 B.C. ), as certified by the remains of walls, statuettes and clay vessels found at Agia Marina.A luxurious green island, known from the antiquity as Pittioussa - the pine-Clad. The favorite resort of Athenians. 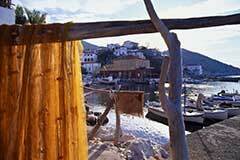 Easily reached after a visit to Hydra, Spetses is an attractive destination as well. Beautiful pebble-beaches, secluded coves, quiet walks in hills, magnificent sunsets, frenzy nightlife. Young couples and not only, come from everywhere to get married on the island. Civil wedding at the Town Hall, or religious wedding in one of the small churches - horse buggies adorned with white flowers, ribbons, violins, jasmine ....a " never to forget" experience. Nauplio, the first capital of liberated Greece (from 1829-1834), has a great little town square and some good restaurants, as well as a decent, small Museum. The museum is located on the second floor of a Venetian arsenal and houses items from Mycenae, Tiryns, Dendra, Asine, Halieis, and of course Nauplio, which served as the naval base of the Argives in archaic and classical times. Some of the more notable items include a bronze cuirass and a helmet made of boars' tusks - not matching, and numerous pottery displays (including the clay figurine depicted here).The Castle of Palamidi in Nauplio is quite high but worth the climb once you get to the top (999 steps!). It looks impregnable, and it was designed by LaSalle in 1711, but in battle it fell after only an eight day seige. There is a beach and you can take a boat out (5 min.) to the island fortress, Bourdzi, where the wildflowers growing from the walls of the building are quite stunning. Try taking a walk around the promontory, Its Kale, on the path just above the water's edge. Also in Nauplio, though I didn't go there, is the Peloponnesian folklore foundation. You can also catch a bus to almost all the other sites in the region from here. Some big cruise ships put in here with day trips to Mycenae or Tiryns or even Epidauros. For some strange reason, I had even better phone connections while I was there than in many places in Athens. Cheaper and fresher fruit than in the cities can be found here too. The oldest archaeological findings from Mycenas are dated around 3000 BC. However, during the alleged Middle Helladic period (1900-1600 BC) the hill was fortified with walls and on the western side there was built a cemetery with tombs inserted in the rock. Around 1600 BC there were built much larger tombs, reserved for distinguished figures. At the same time, they started opening far from the city colossal vaulted tombs, consisting of a long entering corridor and a spacious circular room with a vaulted roof. During the Late Helladic period, the Mycenae were under the sphere of influence of Crete (1600-1500, First Late Helladic Period). Later, Mycenae developed their own civilization, the Mycenean, between 1500 and 1200 BC, which spread to the whole south of Greece, the Mediterranean coasts down to Syria and up to Italy. Around 1350 BC on the hill of Mycenae there were built new colossal walls, preserved up to the present, which surrounded among others a large number of Royal graves. This was the period of the climax of Mycenaean civilization which reached an abrupt end around 1200 BC after the city was abandoned. Today, Mycenae is one of the loveliest places in Greece, thanks both to its natural beauty as well as to the great charm of the archaeological site, associated with so many myths. Once, the entrance must have been decorated with two small pillars covered with marble plaster which depicted multicoloured painted representations. Some fragments of these decorations are today kept in the British Museum in London. The burial chamber or Tholos has a diameter of 14.50 metres and it is 13.20 metres high. It is housed by a vaulted roof formed by 33 superimposed courses of joined conglomerate blocks. The vault was adorned with copper rosettes, of which today only a few flowers and small nail holes are preserved. This was certainly a royal grave and it dates from 1330 BC. Therefore, it cannot belong to the victor of Troy VII or even to his father. The most distant cemetery from the city of Mycenae is the most glorious one, the Treasury of Atreus, as the construction of the "tholos-tombs" was called in antiquity. A long corridor, the dromos, 36 metres long, partly cut into the rock and walled with conglomerate blocks of ashlar masonry leads to a gate 5.40 meters high, surmounted by a lintel and a relieving triangle. The lintel consists of two monolithic architraves, each one literary being a large block of stone, the largest weighing 118 tons. In a green valley full of springs and streams, 10 kilometres on the west of the city of Epidaurus by the sea, the cult of the waters was practiced since the mycenaean times. Whereas the worship of Apollo-Maleatas continued at a temple on the nearby mountain Kynortion, deep in the valley, near the sacred springs, a new Sanctuary was built especially for the worship of Asklepios. Soon the Sanctuary gained great importace and in the fourth century BC, it was fully restored. At the same time, on the slope of the mountain northeast from the temple, a theatre was built, famous since that time for being the prettiest of all the Greek theatres; this theatre is still preserved in almost excellent condition. The theatere consists of a circular orchestra of 20.28 metres diameter has a centre altar of Dionysus. A small ditch (euripus) runs around its perimeter, in order to collect the rainwater. The cavea has the shape of a fan, with 34 rows of seats, pided into 12 sectors by scales holding approximately 6200 spectators. Beyond the semicircular corridor (diazoma), at a later period, there were added 21 new rows of seats with a capacity of another 14000 spectators. The analogy between the number of rows of the upper and lower diazomae is considered to be mathematically "perfect". The first and the last row of the lower part and the first of the upper part had seats with backs and these seats were reserved for distinguished citizens. A complicated set of relationships, largely based on the theory of the golden cut, gave the theatre ideal aesthetic harmony and almost perfect acoustics. The stage that rose behind the orchestra, most of it lost, was supported by 12 Ionic pillars while at each end it had a jutting-out wing. However, during the Hellenistic as well as the Roman period, it underwent several changes that altered its original shape. As it usually happens in Greek theatres, the two spaces between the stage and the cavea (parodoi or passings) were left open to the public due to great circulation. These were adorned with two glorious entrances with Corinthian pillars. Every year at this theatre there took place feasts in honour of Asklepios, including musical and dramatic presentations. In 1954 the theatre was restored into its original shape and since then it hosts every summer the productions of the Epidaurus festival.